Hello again! I saw some of you when I was in the shop in Boise–thank you for your positive comments! Today I am introducing you to Decker the dog. That’s my son, Bo, trying to get him to pose for the camera. For a big dog, Decker is a big chicken–doesn’t like his picture taken. Guess it’s true that dogs are like their owners, because I avoid getting in the picture at all costs! If you check out my earlier posts you’ll see the original sketch. I really wanted to use the yellow fabric for his body, but I didn’t have a large enough piece. Oh well, I just carefully sewed two pieces together. If you look closely, you can see the seam. 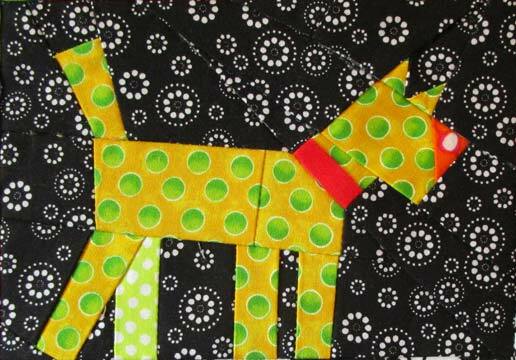 Which brings me to my next trick: Quilter’s Choice glue. It’s a water soluble glue (that means it will wash out later) that holds well and dries clear. Anytime I need to match something up exactly, I take the new piece, fold the seam allowance under and press it. Then I dab a bit of glue on the seam allowance. I place the piece exactly where I want it to sit on top of the first piece, and heat set it with the iron to dry the glue. 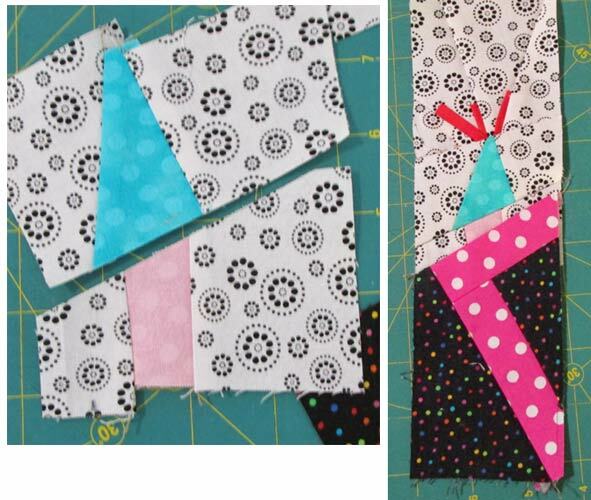 It’s simple to peel back the seam and sew on the pressed fold line. That’s how I managed to line up the dots, and get Decker’s red collar to line up with his body. Ditto for the ears–they were so small I would never have gotten them to line up without a dab of glue! I’ve also started to put a few pieces together. I’m not done by a long stretch, but I’ve started to build out two of my rows. None of my blocks were the same size, so this is where the rule, “If it’s too short sew some more on, and if it’s too big, cut some off,” comes in to play. Della, on her soap box was too tall, so off went part of her hat and the border above it. 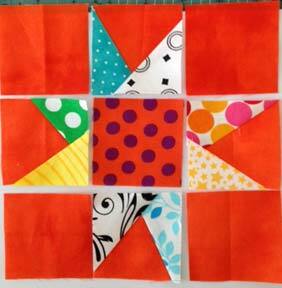 The block of me in my orange pants was too short, so I simply added some scrap squares to make my block longer. Decker got some checkerboard squares to stand on, and some other “parts and pieces” blocks (you are making some of those, right?) got inserted for color and a bit of breathing room. 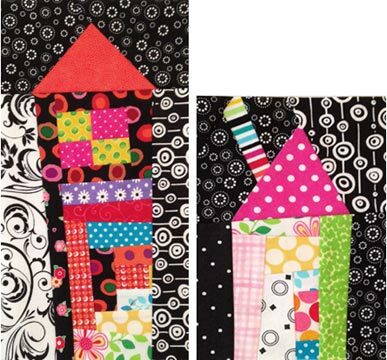 The next row I put together had two tall houses–I wanted to add a third. Rather than start over making a whole new house, I chopped off the roof of another house block, and added a scrappy bottom. 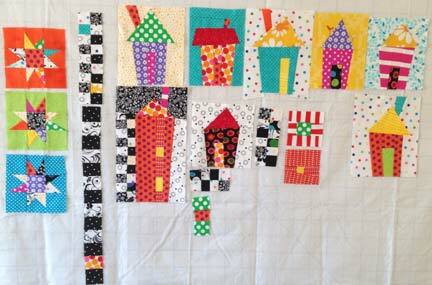 I added some more vertical strips of color, and once again used some of my checkerboard “filler” squares. Notice how on the far left and upper right I chopped them at an angle? I needed to square up the unit so it will fit with the next block(s), whatever they will be! Here I am…decked out for snow. The bright orange pants are truly a bit of “artistic license.” In my block portrayal of Della, I went free-form. In other words, I just cut and sewed without much of a plan. 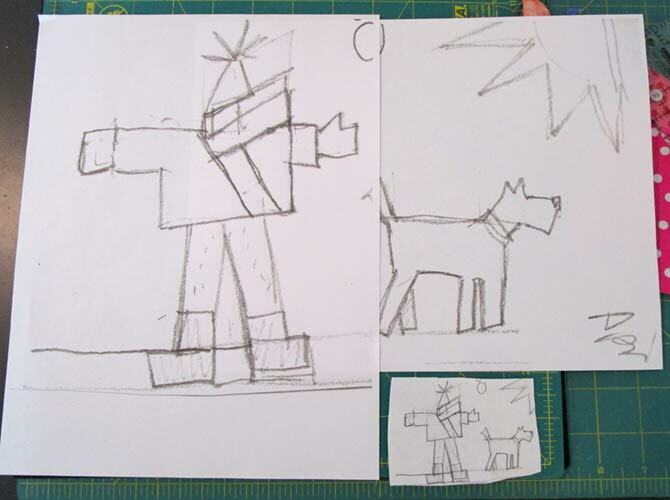 Since my selfie was a bit more complicated, I made a small sketch of my idea–about 2″ tall, and then blew it up on my copier 400%. That sure made things a lot easier when I was trying to judge how to cut the pieces and put it together. You can see the small sketch in the lower right–and the blown-up version. 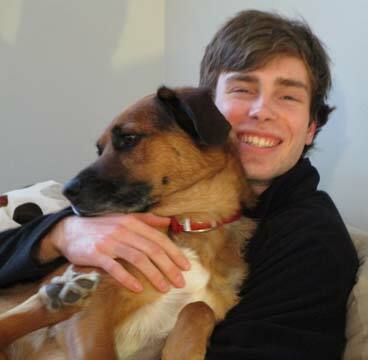 You can also see I’m going to include Decker the dog–he’s next. At the risk of boring you to tears–here’s a few tips on how I made the “me” block. First, I divided my sketch into sections. 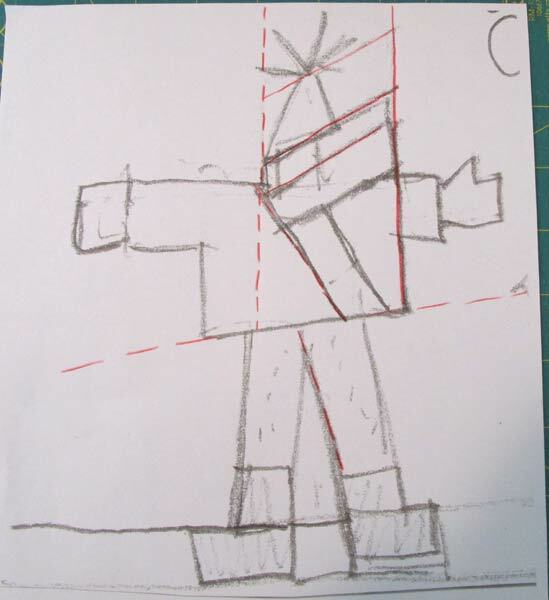 From there, I could see how to make the sections, and the approximate size of the pieces I wanted. That was the nice thing about having a full-scale drawing! 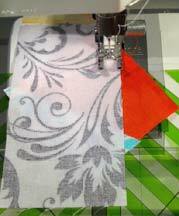 If you try this, don’t forget to add 1/4″ seam allowances to the pieces. As you can see below, I just laid sections on top of the sketch to get the angle I wanted, then trimmed with the added seam allowances. Note how much longer the scarf/body is than the final block shows. 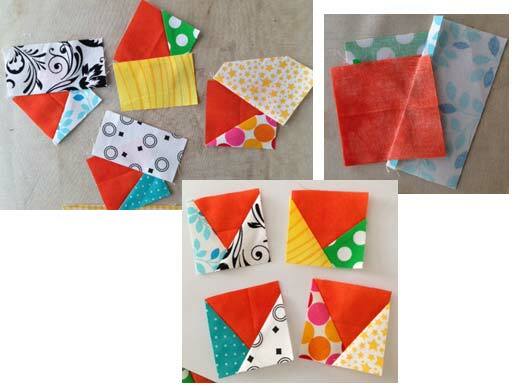 It’s sooo much easier to make something longer–I like to fold it to where the seam needs to be and press it. That way I can lay it on top of the next piece and know exactly where to sew to get the look I want. Next are the beginnings of the face and hat. You can also see that I have a habit of making the pieces lots bigger than I need–it’s easier and they can always trim down. The tassels on the hat were Della’s idea–it worked out great! 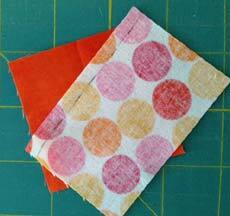 I started with a small (~1-1/2″ tall x 3/4″ ) rectangle of bright red fabric. Then I folded down the top edge, and folded it in half lengthwise. I inserted it between an angled seam and viola! I did that a few more times until I liked the angles. That’s it for now. 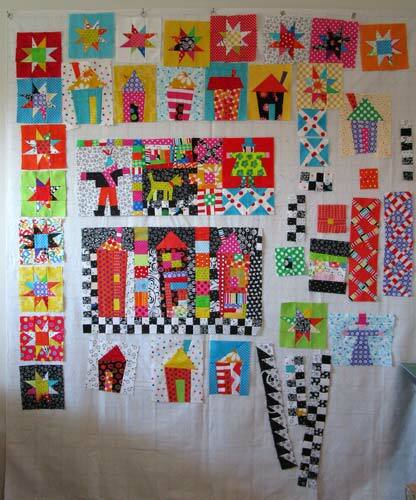 I’ve been making stars and checkerboard strips in-between all the stopping and starting. 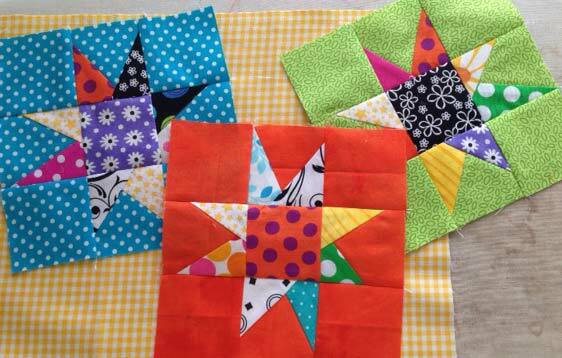 I’ve got thirteen 6″ stars done…guess I’d better get busy. Some of you know Della from the store. Always smiling and laughing, she is my best friend. 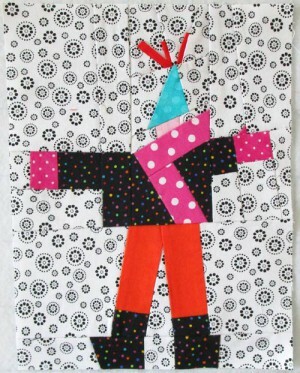 So it only seems right that I would have to put her in my wonky quilt. The picture on the left is my first attempt. We’re miles apart but as usual, she added her two cents and requested the lime green dress and curly hair. Let me know if you need help making a “people” block. I can certainly step you through it. There! It’s done! 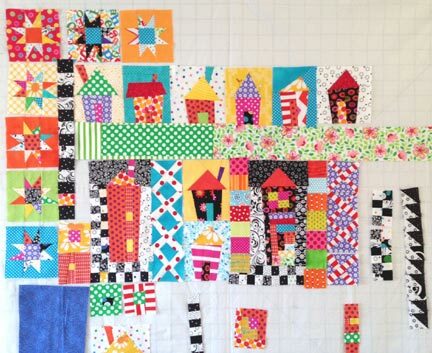 Not really–this is a picture of my first wonky quilt. I shared this last week at our in-store seminar, and thought some of you might want an “end-game” picture. 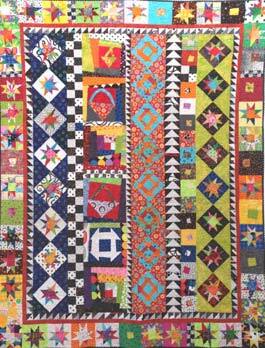 Even though I love this quilt, I see a lot of things that I could change. I won’t go into detail on that for now; let me know if you’d like me to share my critique! 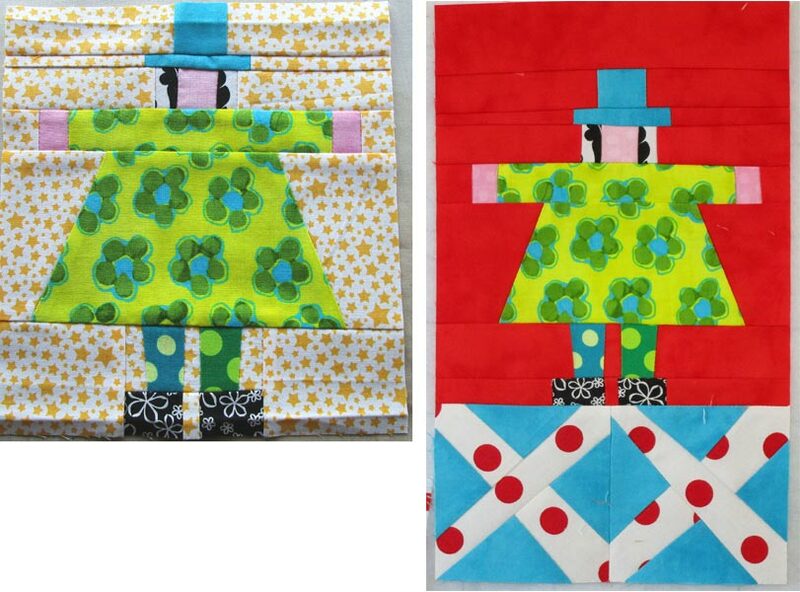 But like every great artist who often painted a series of paintings, (lot’s of tongue in cheek with that comment) I think I just need to make more wonky quilts. I hung this one on the wall here in Michigan–it’s amazing what it does to cheer the place up! I managed to hang up my design wall–I just love it! It’s a great size: 60″ x 72″ with grommets across the top. It is recommended to hang it on your wall with adhesive hooks, but I went the distance and put a few nails in the wall. If you want a design wall of your own, we have them in the store. 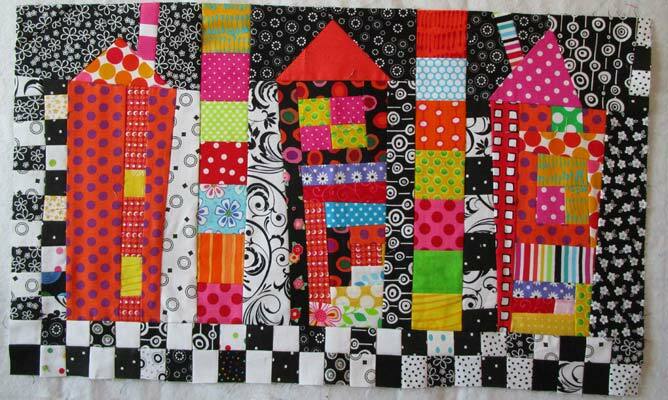 I think a design wall is a must for this type of quilt. Right now I’ve just plopped my pieces up on the wall–I’m sure I’ll play with arranging them multiple times.